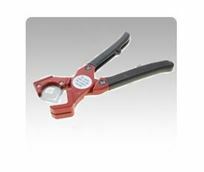 ATP Pneumatics NEW TechniCut™ premium hose & tube cutters are superior, professional grade tubing and hose cutters specifically designed for production settings where ergonomics and accuracy are important. The shape and design of the TechniCut differs from other cutters as it engages the tube via the blade’s edge, rather than the point. This adds up to a clean cutting capacity of 1” OD in tubing and non-metal reinforced hose. All TechniCut™ items are Made in USA.